A Typically Japanese Dining Experience? Think of Japanese cuisine and naturally the first few things that spring to mind will be along the lines of sushi, ramen and just about any other rice/noodle dish on the Wagamama menu. However I think the place we visited last week could well be the most Japanese experience of the lot. Having won big at the races (to people who don’t know the currency ¥2000 sounds big, right?) it was time to head back into the city to splash some cash on a gourmet dinner. 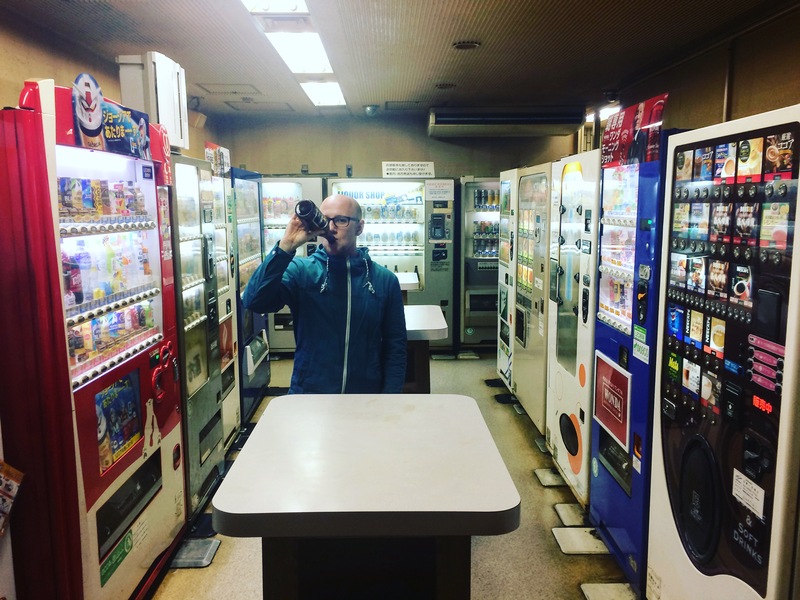 Glen had recently seen a video of a ‘restaurant’ in Gunma which was made up entirely of vending machines and had been keen to try out a similar place he’d found in the Shimbashi area of Tokyo. I knew absolutely nothing about Shimbashi aside from the fact that it is a haven for salarymen and – late on weeknights – drunken salarymen. As we were heading there on a Sunday though, it was more reminiscent of a ghost town than a thriving business area. Literal translation: ‘Benda Sutando’. Seriously. Now I’m not sure what I expected from this place but when I’d heard you could get beer, hot food and many other things from automated machines I perhaps rather foolishly thought it might be some futuristic diner with robots running the show. 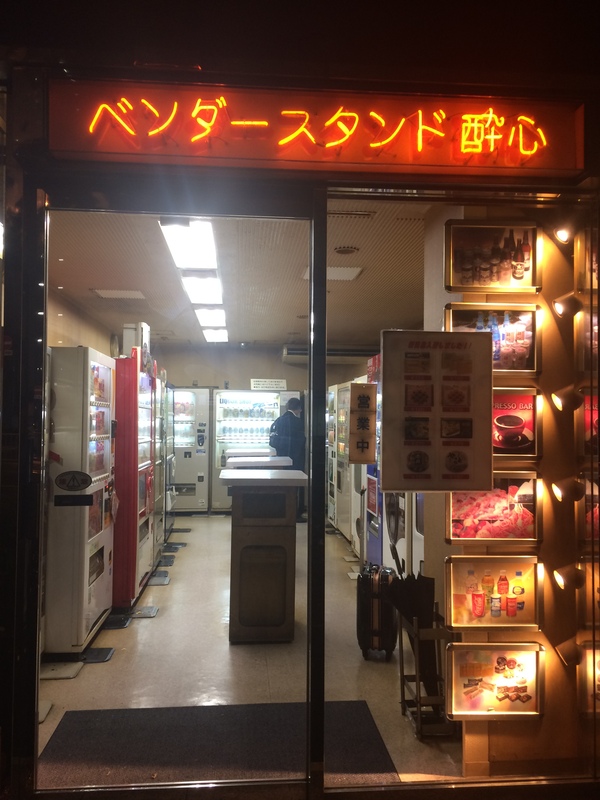 It had crossed my mind that the hot takoyaki, yakisoba and burgers that could be acquired from these machines had been lovingly prepared in advance and popped into the machine ready to be heated up whenever a customer so desires. In reality however, it was exactly how Glen had described it: a room full of vending machines. 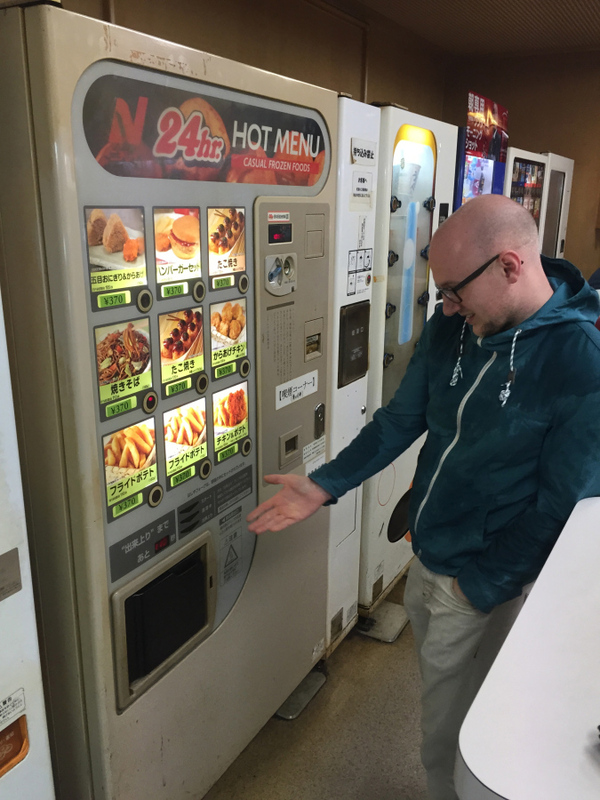 I shouldn’t have been surprised, considering there’s a vending machine on every corner in Japan, but it was still a little different from what I’d expected! Lovely place for a dinner date, I’m sure you’ll agree. Undeterred, we got ourselves a few reasonably priced drinks from one machine – ¥300 for a very big bottle of Asahi being my choice! – and set about exploring our options. If anyone remembers the old school type of vending machines you used to get at school then you’ll understand my shock and amazement when my bottle didn’t shatter and spray glass and beer everywhere; it was dropped from quite a height! I was immediately drawn to the hot food vendor which offered a variety of ‘cooked’ (microwaved) meals including yakisoba, takoyaki (fried octopus balls which you may remember from my Osaka post), burger and chips and fried chicken. You’ll be surprised to know that despite my apparent willingness to eat anything I wasn’t quite feeling brave enough to go for microwaved pre-cooked chicken from a vending machine, so instead opted for the safer option of yakisoba – fried Japanese noodles to you and I! After a two minute blast in what I can only imagine was a nuclear powered microwave, the door on the machine unlocked and I was now able to take my piping hot noodles back to the table and dig in. I have to admit whilst I’m usually very sceptical of microwaved/instant meals, if there’s one area that Japan excels in it’s instant noodles. Perhaps rather unsurprisingly then, the yakisoba wasn’t all that bad and in hindsight maybe I bottled it a bit by playing it so safe with the first dish! Playing it safe is something Glen could definitely be accused of though as he rather bravely opted for a burger and chips. 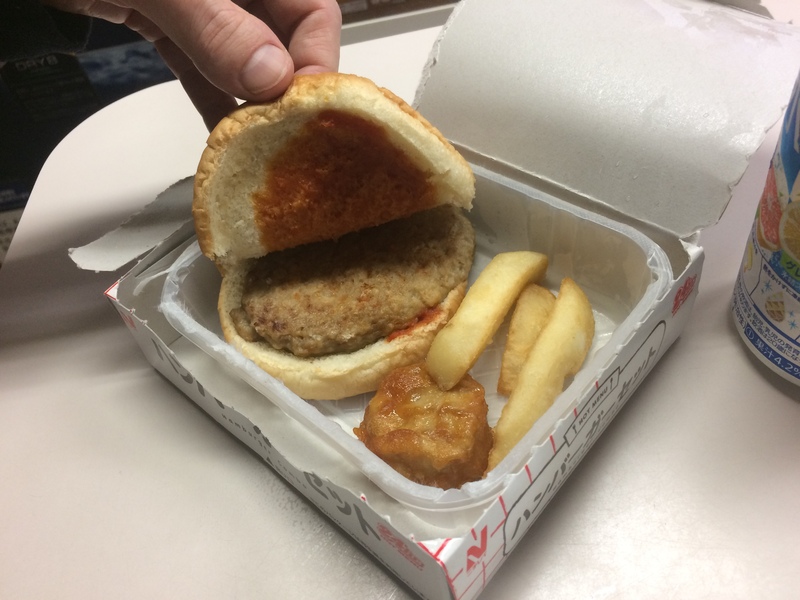 Now I’ve had Rustler’s burgers back home before and they’ve always done a job, but this burger was about as cheap and nasty as it got! In true Japanese fashion the food was put in the middle of the table and shared between us, so we had the opportunity to try both meals and having stumbled upon a still slightly frozen chip in the box – not to mention the general cheap and nasty nature of the burger – I think we both agreed I’d won this round! 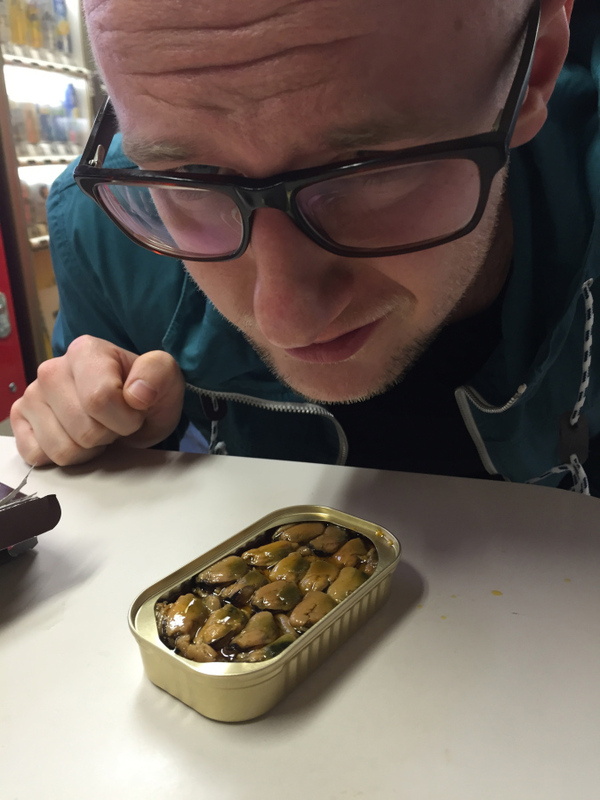 It was a return to the hot vending machine for Glen next as he decided on some takoyaki whilst my curiosity got the better of me and I slightly foolishly decided that a tin of smoked mussels and some yakitori (also in a can) would be a good idea. As I say it was more a case of curiosity than actually being tempted by them and of course my expectations were somewhere between the floor and underground. 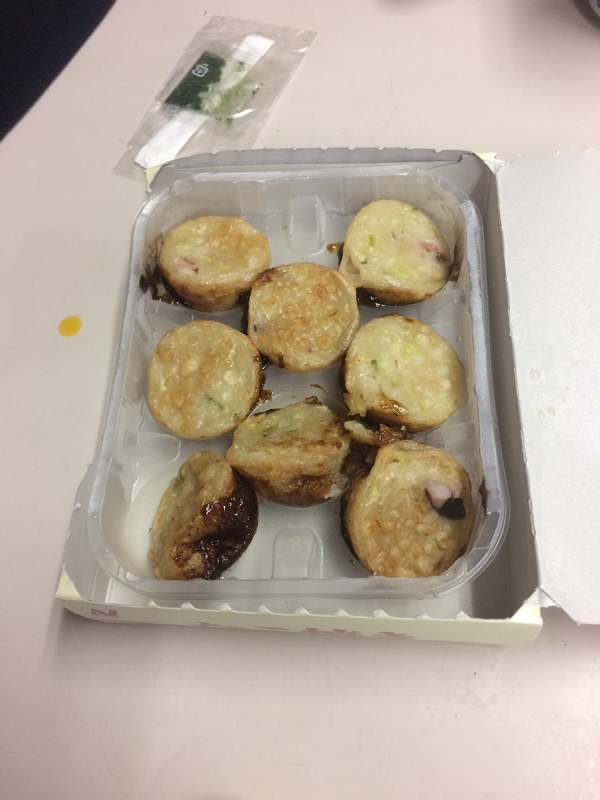 As expected the takoyaki were slightly soggy due to the fact they’d been microwaved from frozen, however they were definitely a step up from the burger. Of course they still managed to take a layer of skin off the top of my mouth too, as is standard with takoyaki! Not the best looking takoyaki I’ve ever seen! 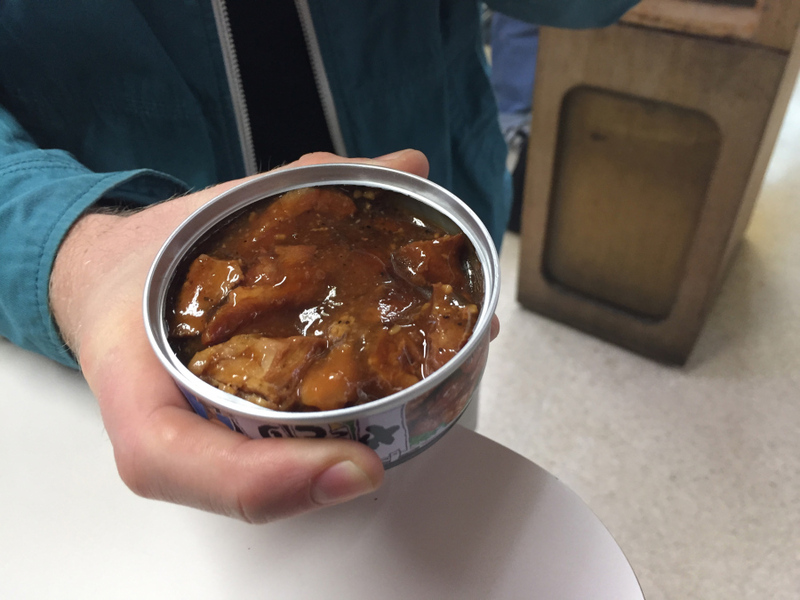 The same could not be said for my tinned goods and my incredibly low expectations were maybe just about exceeded. First up were the mussels and even though I wasn’t expecting Michelin star seafood I still struggled to find my appetite for the mushy, slimy mess I found in front of me. That said, there are children starving in the world so I powered through like an absolute trooper. They don’t make them like me any more. The texture was probably the worst thing about this. The taste itself wasn’t too bad – albeit far from standard mussels – but the texture was kind of similar to eating liver or other types of offal. Not the best. I’m not sure why I expected anything better than what I got. Despite what the can said I’m not entirely sure the yakitori had ever seen a grill or a flame. I suppose we don’t know how long it had been there and the charcoal taste may have worn off quite quickly. To our surprise it didn’t actually taste all that bad despite looking more like something you’d feed to a dog rather than a human. Then again, has anyone ever had a Fray Bentos pie? The tastiest dog food this side of Tokyo. The two Japanese blokes on the next table finally left so being the dedicated bloggers (read: saddos) that we are the pair of us decided to get another drink and take advantage of the empty place and take a few pictures. Thankfully Glen took a lot more better pictures than me and you can see them in their original place in his post! As you can see, these pictures were all completely natural and there was absolutely no posing involved. Nope, none at all. 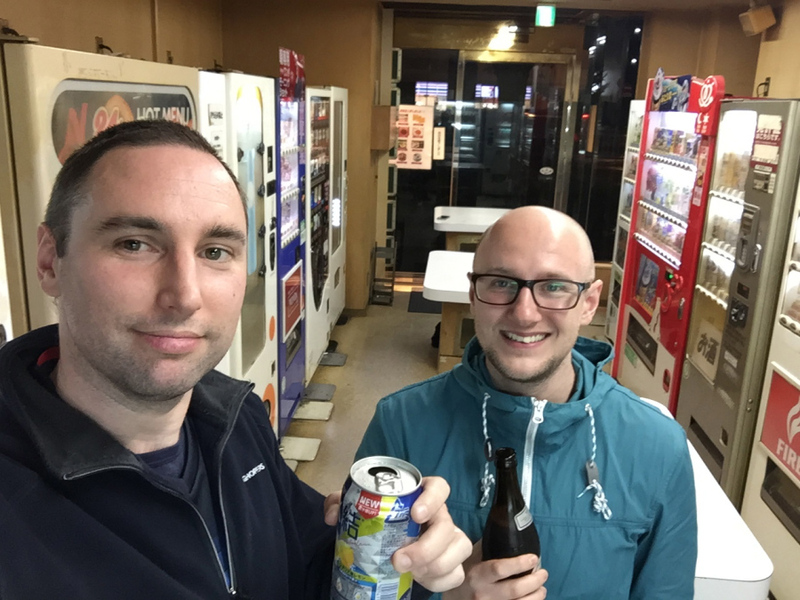 When the salarymen are away, the bloggers will…erm…take selfies.